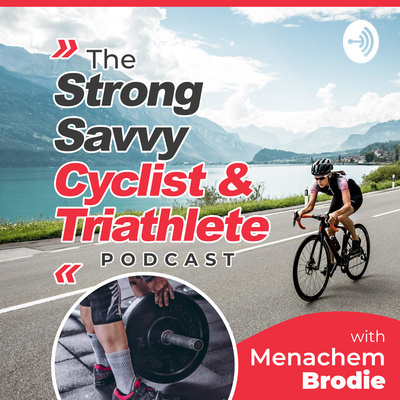 The Strong Savvy Cyclist & Triathlete Podcast presented by Human Vortex Training & USA Cycling Expert Level Coach Menachem Brodie gives cyclists & triathletes of all levels & abilities the opportunity to learn about Strength training, Physiology, Psychology, Nutrition, & much more, as Coach Brodie shares his experience and talks with other top experts. Taking YOUR questions, we're here to help you get more out of your training, and to learn how to "Train Smarter, Not Harder, because it is all about YOU!™"
In Part 2 with Dr. McGill we go a bit more into the weeds and talk more specifics for cyclists, as well as why and how one needs to "Be an athlete 24/7". Make sure to listen to Part 1 before this, and check out our YouTube Channel @HVTraining, to view this episode, along with all the models Dr. McGill refers to. Tony Gentilcore is not only a great guy, but he's also been around the strength game for quite some time. When he's not writing his Pulitzer(ish) award winning blog, he's helping people get stronger, fitter and faster.... And today, we get to pick his brain and kick around some important topics as it pertains to endurance athletes. In part 1 of our conversation we talk about "Complimenting your other training", what topic leaves people with "The Largest Eyeroll In History"- but why it's absolutely integral to success, and much, much more! This week Coach Brodie shares with you some big takeaways from our last 2 interviews with Running Expert Dr. Kasey Hill, and Speed & Agility Expert Lee Taft. This will be a staple of the Strong Savvy Cyclist & Triathlete Podcast, after every 2-3 complimentary interviews, Coach Brodie will go back through the interviews and dig out a few diamonds to give you, the listener, to help you progress your fitness, training, and abilities to all-new levels. While not all take-home episodes may be this polished, I believe it's important to give you as much of an insight as possible on what I'm doing here at HVTraining, what's worked (and WHY) i the past, and even some things that I found interesting or significant in those interviews. Most triathletes and runners focus on endurance, and perhaps a little bit of speed work at the track...but what if I told you that agility, jumping abilities, and strength training can significantly boost your performance? Lee Taft is known as "The Speed guy", and has been coaching amateur to professional athletes how to be faster, quicker, and more agile since the 90's. While he is commonly sought out to help baseball, basketball, and other field sports athletes, Lee actually has a deep background in Cross Country and Track. In this episode Lee talks about how, why, and how much triathletes and runners should be working on their jumping and agility, as well as shares with us some very important insights into how your body works when dealing with the forces out on the road. Dr. Kasey Hill is a Sports Medicine Doctor in Baton Rouge, LA, who has been helping Runners, Triathletes, and a variety of other athletes get stronger, fitter, and healthier with his 12 week group training classes targeted towards running called "Power Running". From which shoes may be best for you and why shoes don't prevent injuries, to "Toe Yoga", what the heck is the "Rotisserie Chicken Exercise" (Hint: it does NOT involve KFC, Chick-Fil-A, or Popeyes) and why it may be a valuable addition to YOUR strength training program, this episode is packed full of great expert insights and tips to help you see a boost in your running power. Ep 2: Force Creates Motion, BUT Stiffness CONTROLS Motion! In episode 2 Coach Brodie talks about his recent appearance on the GCN Show to help Hank & Dan crush their pushups proper, and why force production in itself is not the end goal of a strength training program.... but STIFFNESS and force production ARE. Learn why Pushups may not be "bike specific", but the FUNdamental 5+1 Movements of Push, Pull, Squat, Hinge, Press, and Rotary Stability ARE IN FACT critical to master if you're looking to crush your on-bike or in-sport goals. In our first episode, we'll talk briefly about how and why there is no single answer for each training question: especially when it comes to strength training, and talk a little bit about stretching. I'd love to hear from you! Email your questions to Brodie@HumanVortextraining.com and be sure to subscribe and share!